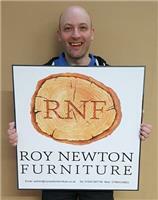 Roy Newton Furniture - Bedrooms based in Cannock, Staffordshire. We are a family run business based in Cannock, Staffordshire that specialises in bespoke fitted bedrooms and home offices. We also manufacture freestanding furniture and entertainment centres. Our aim is to offer a friendly, personal, yet professional service to all our customers from the initial design visit through to the completion of the bedroom or office. Roy, the business owner, has worked in the furniture trade for 22 years enabling us to have a detailed overview of the whole process from the factory floor to the installation of your dream room. All of our furniture is made-to-measure to your individual requirements so awkward shaped rooms or angled ceilings are no problem to us! We cover approximately 30 miles of Cannock.